Common interaction patterns in a web app that uses a persistent store. Implement some of the common interaction patterns in a web app that uses a persistent store. In the previous assignment, you implemented some of the common interaction patterns. In this assignment, you will implement the remaining patterns. Create a new web app, named Assignment3. It MUST use the “Web app project v1” project template. We will be working with the employee and track entities. 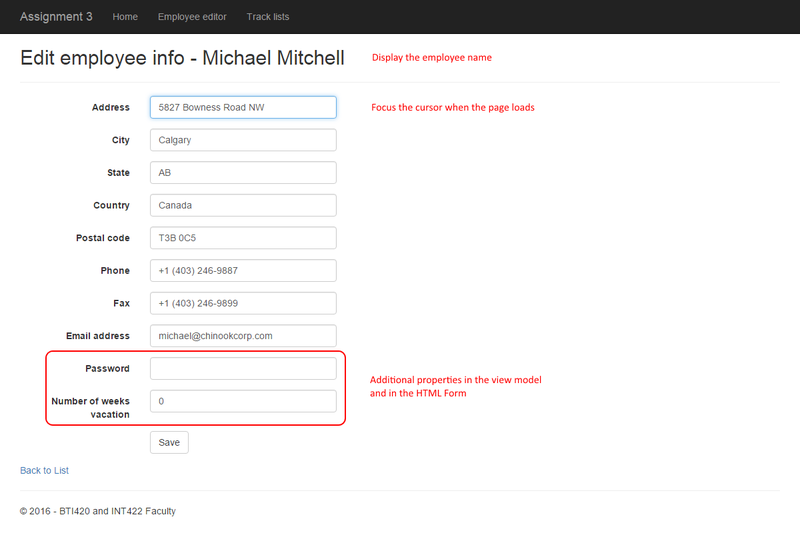 It will help you visualize where the Employee and Track entities are located in the design model. Go ahead and write those view model classes. As with Assignment 2 (and the code examples), you can ignore navigation properties, and the Employee.ReportsTo property in the Employee class. The Track design model class has an attribute named “Column”. It cannot be used in a view model class, so do NOT include it in your track base view model class. All view models require suitable data annotations. Study each property, and determine which data annotations should be added. No, we will not tell you which ones to add. As you have recently learned, the typical pattern for “edit existing” is to write two view model classes. One will carry data to the HTML Form, and the other describes the data package that is posted back to the controller method from the browser user. The class notes and code examples have all you need to implement this part of the work plan. TrackGetAll – Typical “get all” method, but you should sort the results (on two properties) in a way that makes sense to you. Data for the track entity looks like the following. Click to open the image full-size in a new tab/window. Two controllers are needed, right? One for Employees, and one for Tracks. The “get all” use case will show the default view when working with employee objects. Each employee will have an “Edit” link at the right side. This view will also be the destination after a successful “edit existing” task. Here’s an example screen capture. Click to open the image full-size in a new tab/window. As noted above, the class notes and code examples have all you need to implement this part of the work plan. Don’t worry about the “extra” properties that are part of the object that is posted by the browser user from the HTML Form. They will not match any of the design model object properties, so they will be ignored. The destination after a successful “edit existing” task must be a redirect-to-action to the Index action. In this part of the assignment, you will get some experience with some basic LINQ functionality. 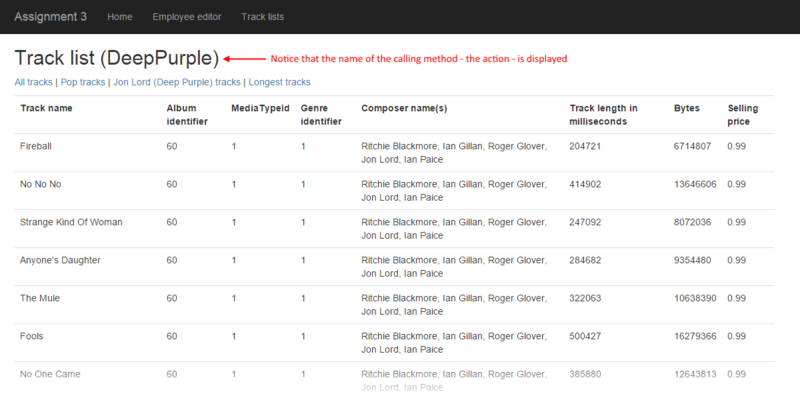 The list-of-tracks view – which by default, is scaffolded to the “Index” view – will host this functionality, and work with some new methods in the controller. 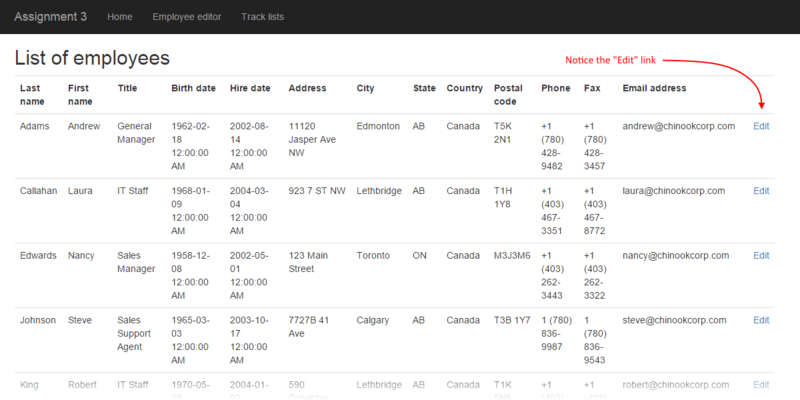 This will be done by adding some links – as ActionLink HTML Helpers – near the top of the Index view. The scaffolded TracksController class has an Index() method. It will call the typical “get all” method, and return in the typical manner. Think carefully about the other method names, because they will become part of the URL. Don’t include the word “get” in the method name. Each method will call a method in the manager object. Then, each method will return the Index view, and pass on the fetched collection. As noted above, you will add some links – as ActionLink HTML Helpers – near the top of the Index view. Each link will call the appropriate action/method in the TracksController. Make sure that you include a fourth link, which simply will call the Index action/method, to show all tracks.